I celebrated New Year’s Eve (and the first few days of the year) in New York City with my husband and daughters. We surprised them with this trip on Christmas morning…can I just say surprises are hard to pull off when your kids are older. I’ll share the highlights of our trip in a blog post next week. That’s us on New Year’s Eve in front of Rockefeller Center. 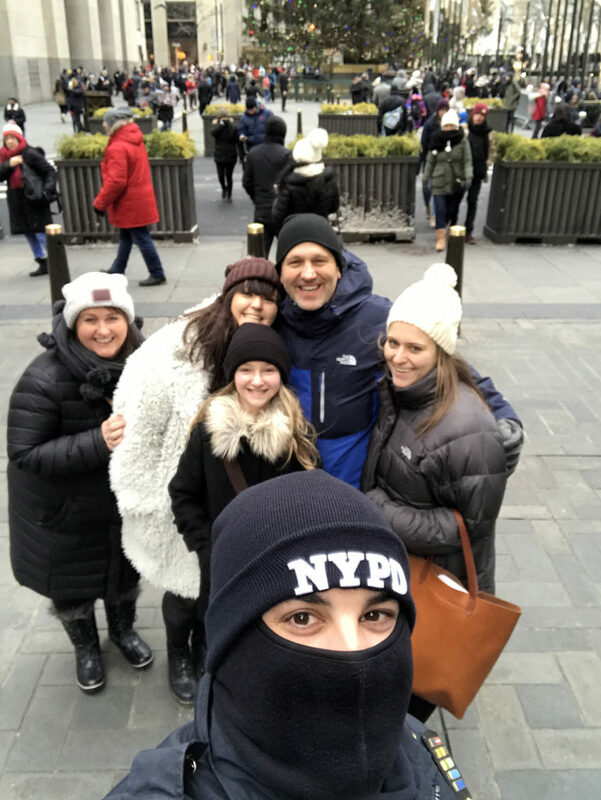 A huge shout out to the NYPD for all they do to keep the city safe, as well as their selfie skills! So here are the ways I am going to improve my life in 2018! I am going to spend more time reading and less time on social media. I used to spend at least a half hour every night before I went to bed reading…that was before smart phones, Instagram, Facebook, Twitter, and Snapchat. I’m looking forward to “getting lost in a book.” First up…I’m finishing “Big Little Lies,” which I started reading last summer during our flight to Paris (now that’s embarrassing that it’s taking me this long to finish it). Of course, there isn’t a year that goes by without adding this to my list of goals…living a healthy lifestyle. I definitely lost sight of this during the holidays, soooo…I’m starting the WHOLE 30 program on Monday. I like the thought of detoxifying and reseting my relationship with food. If you’ve tried this and have any tips or recipes, send them my way. I might even share our (Phillip is doing it, too) progress along the way. I also need to find my way back to Orange Theory…I “lost” my way there and my instructor keeps calling to get me back in a class. So that’s it…three “resolutions” for a better 2018! Hoping your new year is off to a good start!